What is the Future Ready PA Index? The accountability system for Pennsylvania public schools looks a little different this year. 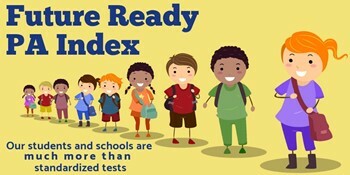 The Pennsylvania Department of Education has replaced School Performance Profiles (SPP) with the Future Ready PA Index. The Future Ready PA Index, which is meant to be a more holistic approach to measuring school performance, includes the measures of academic proficiency and growth, along with some new measures such as career readiness and chronic absenteeism. Click here for more information and quick links to West Shore's school profiles.